Mumbai: The Narendra Modi government strongly disapproves of incidents where Swachh Bharat mission volunteers have publicly shamed and beaten up people defecating in the open, said Parameswaran Iyer, the union secretary who heads the programme in rural India. 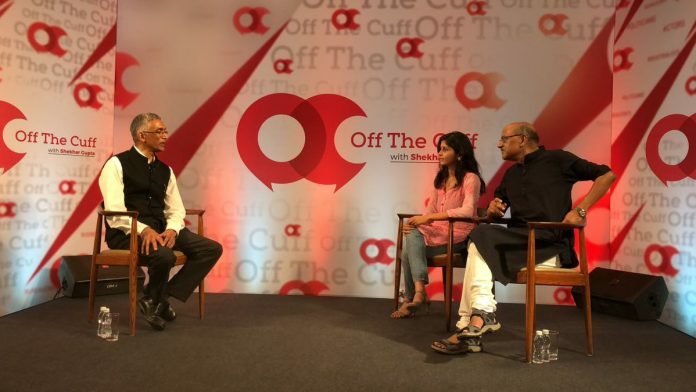 In conversation with ThePrint Editor-in-Chief Shekhar Gupta and Associate Editor Manasi Phadke, Iyer said that, at the community level, gram panchayats or village committees were permitted to have their own rules for sustaining their ‘open defecation free’ status. “But, we certainly do not support coercive behaviour. Naming and shaming by government officials is a no-no for us,” he added. Iyer, a 1981-batch IAS officer of the Uttar Pradesh cadre, took voluntary retirement about seven years ago to work with the World Bank on sanitation. The Modi government brought him back on a contract to steer the Prime Minister’s pet Swachh Bharat mission. Under the programme, the Modi government has vowed to make India open defecation free by 2019. According to the officer, the scheme, under which the government seeks to lay greater emphasis on changing habits rather than simply building toilets, has already started showing results. Quoting a recent World Bank survey, Iyer said 93 per cent of the toilets built under the Swachh Bharat were in use. This, he added, shows that the government’s campaign to bring about a behavioural change at the grassroots level seemed to be working. He said the government was trying to bring about this behavioural shift in two ways — through mass media campaigns such as Amitabh Bachchan’s ‘Darwaaza band’ campaign to shut the door on open defecation and movies such as Toilet: Ek Prem Katha, and through interpersonal communication at the grassroots level. “We have a phenomenal movement going on through our swachhagrahis, the grassroots-level motivators. We have 4.5 lakh swachhagrahis in India and would ideally like to have one in each village,” he said. “These are trained motivators who go door to door, talk to people, make them understand why sanitation is important and trigger behaviour change,” Iyer added. A common argument encountered against the toilet-building drive is water scarcity. To counter this, Iyer said, the government has linked piped water supply to the Swachh Bharat. What this means is that the government has decided to offer piped water supply to every village that attains ‘open defecation free’ status. The government is also promoting the use of steep slope pans, or toilet bowls that require only about a litre-and-a-half of water to flush instead of the usual 4-5 litres, he added. Another major hurdle has been people’s reluctance to clean and maintain toilets, often on account of caste- and class-based divides. Here, the government is seeking to lead by example — recently, for example, Iyer, on a visit to a Telangana village, went inside a twin-pit toilet and picked up faecal matter with his hands. The twin-pit toilet, among the pivots of the programme in rural India, consists of two sewage pits. When one fills up after four to five years, it is closed and the other opened for use – in another year, the faecal matter in the first turns to compost, which can then be used in the fields or sold. Iyer said the government had also got personalities such as Comptroller and Auditor General of India Rajiv Mehrishi and actor Akshay Kumar to demonstrate how such toilets can be cleaned. “The attitude is changing,” he added.